In this example we show how to connect a MLX90393 magnetic field sensor to a MSP-EXP432P401R LaunchPad, the example will use the Energia IDE. The MLX90393 is the newest addition to the Melexis position sensing portfolio, bringing the highest flexibility in the portfolio’s smallest assembly. Complementing this, the magnetic field sensor is designed for micropower applications, with programmable duty cycles in the range of 0.1% to 100%. 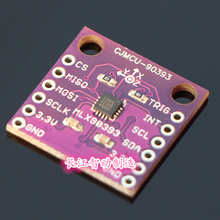 The MLX90393 magnetic field sensor can be reprogrammed to different modes and with different settings at run-time. The sensor offers a 16-bit output proportional to the magnetic flux density sensed along the XYZ axes using the Melexis proprietary Triaxis® technology and also offers a temperature output signal. These digital values are available via I2C and SPI, where the MLX90393 is a slave on the bus.